Chicago police detectives are warning residents of Lakeview and North Center after investigators found connections between two of the many recent robberies in our neighborhood. 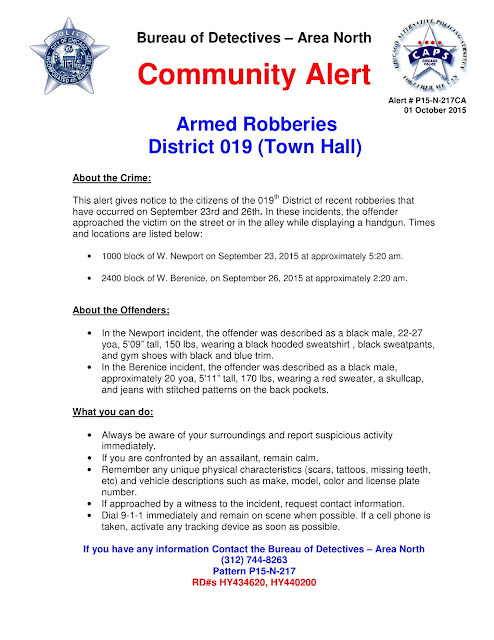 According to a newly-released community alert, the offender displayed a handgun while approaching victims in the 1000 block of Newport in Wrigleyville last Wednesday and again on Saturday morning near Western and Berenice, in the nearby North Center neighborhood. As CWB reported in our story about the Newport robbery, police believe another robbery was committed by the same offender about five minutes later in the 1300 block of W Waveland. That's because a resident there reported hearing a scuffle outside and then heard a man tell someone to "drop everything and start walking." Police were unable to find the victim on Waveland and city records show that no report has ever been filed in the case. According to the community alert, the offender on Newport was described as a black male, 22 to 27 years old, 5'9" tall, 150 pounds, wearing a black hooded sweatshirt, black sweatpants, and gym shoes with black and blue trim. On Berenice, the gunman was said to be a black male, approximately 20-years-old, 5'11" tall, 170 pounds, wearing a red sweater, a skullcap, and jeans with stitched patterns on the back pockets. Area North detectives would love to hear from people who have information. Call them at (312) 744-8263 and refer to alert number P15-N-217CA.